First launched in 1926, using just 4 key ingredients, our super-moisturising Skin Food is celebrating 90 years as an iconic beauty classic, using exactly the same formulation today as it did back then. Calendula, chamomile, rosemary and wild pansy combine with a smoothing base of organic almond oil and sunflower oil, organic beeswax and the purest hypoallergenic lanolin to make up our #1 bestseller. No wonder dry skin devours it! Weleda's company motto – "In harmony with nature and the human being" – already highlights the values that have a crucial influence on Weleda's business aims. When they say ‘all natural’, they mean ‘all natural’. Weleda aim to use only the purest wild-crafted, organically and Biodynamically cultivated ingredients for their products. Toxins, additives and raw materials from mineral oils simply won’t do. But natural isn’t enough for Weleda, their ingredients have to be effective too. They have to work with your body’s own ability to heal, restore well-being and impart radiance. So to ensure their ingredients maintain their innate potency, they harvest them quickly, then process them as little as possible, taking excellent care of them along the way. Weleda feel a certain level of responsibility to their crops the same way they feel a responsibility to you. And because they believe unwaveringly in cultivating beauty for all creatures, they don’t test their skin care products or their ingredients on animals and neither do their suppliers. Period. No asterisk, no small print. resources are limited and must be conserved. Consideration, love and respect for nature place an obligation on Weleda to take this responsibility seriously. To Weleda, acting sustainably means caring for and conserving natural resources. All Weleda's actions should serve the good of our customers, employees and partners, and should be characterised by love and respect for nature. Fair treatment of customers, partners and suppliers. Transparency and ongoing communication form the basis for committed and effective cooperation. This is the foundation underlying Weleda's worldwide business relationships. Partnership between management and employees. Staff are informed about business processes and structures and take on responsibility for their work. This enables them to participate in the judgement and decision-making processes that affect their area of responsibility. The commitment of all employees forms the source of innovation for the company's development. Cultural diversity as a force of inspiration. 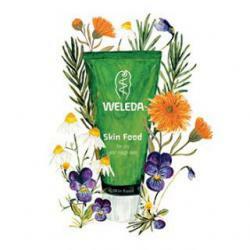 The Weleda Group is represented in numerous countries and markets worldwide. The resulting cultural diversity is felt as empowering and inspiring throughout the organisation. - AWARDS for WELEDA 2012: Weleda receive 39 Awards from 17 Organisations! - Weleda Skin Food featured on Dolly Rouge.ie: Weleda Skin Food featured favourite on "Dolly Rouge"